Pick niece birthday wishes as wonderful as your niece. 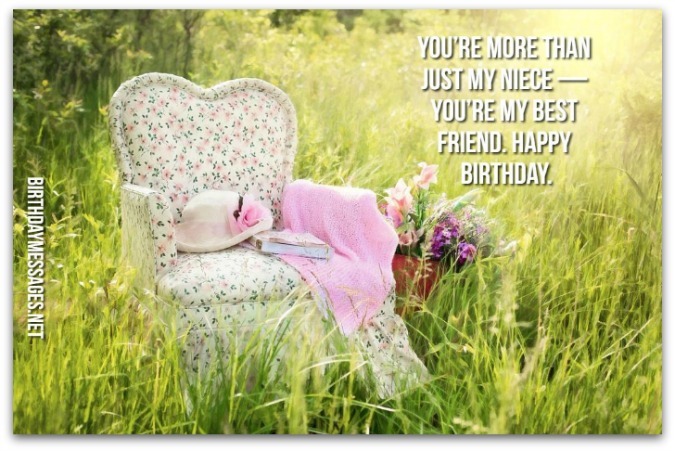 On this page, you can choose from beautifully written, unique birthday messages for nieces. It’s as simple as selecting the birthday verse that truly expresses how much you love your niece. 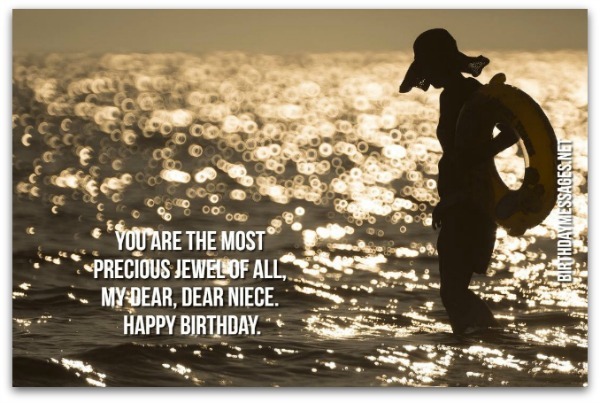 If you’re ready to start your search, keep in mind one simple rule of thumb: choosing the right niece birthday greetings is all about selecting the birthday messages that accurately and beautifully express how you feel about your niece. Period. Whenever you need an extra shoulder to cry on, you can count on me to give you mine. I love you. Happy birthday. With a niece like you, life is so much fuller than I ever expected. You fill up every room you enter with so much joy. Happy birthday. Sweet niece, you light up every room you’re in. Happy birthday. There’s only one way to explain why I love you, my beautiful niece, so much: you. Happy birthday. As your aunt, it’s my official duty to spoil you rotten. Let the shopping begin. Happy birthday. I never thought being an aunt would be so cool. Then, you arrived on the scene and I became the coolest aunt in the world, with the absolute coolest niece anywhere. Happy birthday. When I’m with you, life is all smiles, laughs and hugs. Happy birthday. Being an aunt with such an amazing niece like you makes everything more amazing. Happy birthday. As my niece, you deserve to be spoiled. As your aunt, I deserve to spoil you. Now that’s synergy. Happy birthday. The only ingredient for a happy aunt is an incredible niece like you. Happy birthday. Before you were born, I thought I had everything I could ever need or want. When you entered this world, I realized that life is so much more meaningful with you in it. Happy birthday. My brother has done many amazing things in life, but nothing as wonderful as you, my beautiful niece. Happy birthday. 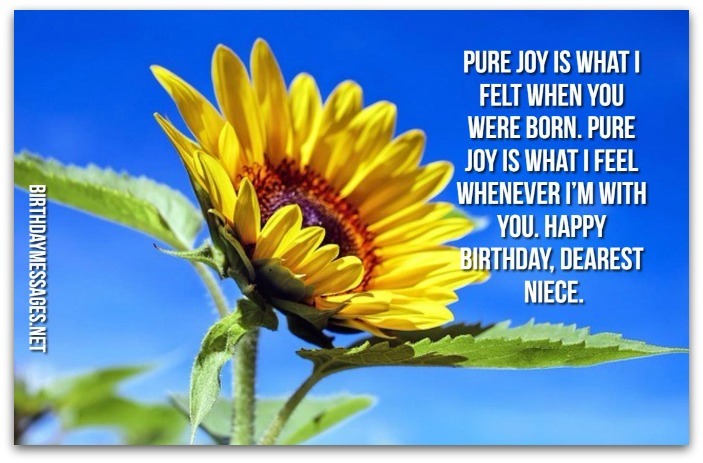 PIcking just the right birthday messages for your niece is a chance for you to show her why she matters so much to you (beyond the obvious) with well-chosen, beautifully written words. What's the perfect birthday greeting for your niece? 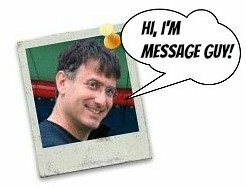 Sending generic (i.e. standard) birthday wishes is not the wrong road to take, but it's just barely right. Of course, this is the easiest way to demonstrate how much you love her. Still, you can do much, much, much better — plus your niece deserves much, much, much better on her special day. 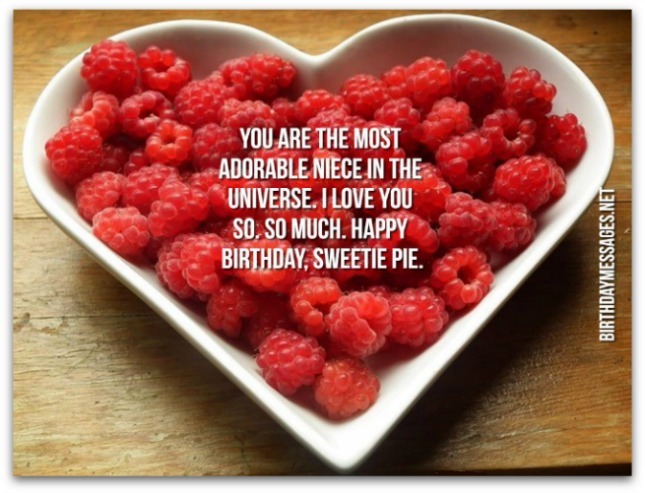 To make it easier for you to choose the best niece birthday messages, I've provided you with lots of birthday verse styles to select from, so you can pick the one (or how many you want) that's suitable for her. Sporty niece: Go for an inspirational birthday greeting. Mature niece: Opt for a cute, clever or cool birthday message. Cool niece: Select a cool or clever birthday wish. Creative niece: Choose an inspirational, funny, cool or clever birthday wish. Immature (or young) niece: Pick a cute, sentimental or happy birthday verse. The tips above are only helpful hints. Because you know your niece better than I do, trust your instincts when it comes to choosing niece birthday wishes — they won't let you down in this department. Feel free to mix and match various types of birthday messages to end up with the best niece birthday wishes for her. Naturally, if you have uncovered terrific niece birthday messages that suit your niece, do not alter a thing (keep them "as is"). You have so many choices — over 50 of them to select from here. We are the best aunt-niece team this side of the shopping mall. Let’s shop until we drop. Happy birthday. Aunthood is the best neighborhood to live in, with a niece like you, sweetie. Happy birthday. With you as my niece, I will be forever young and full of joy. Happy birthday. I relive my youth every time I get the chance to see life through the eyes of an incredible niece like you. Happy birthday. Pure joy is what I felt when you were born. Pure joy is what I feel whenever I’m with you. Happy birthday, dearest niece. Happy birthday to my favorite (and only) niece. You are your mother’s daughter but you’re my BFF. Happy birthday from your favorite aunt. I have many friends but you’re at the top of the list. With a niece like you, I have all the BFFs I need. Happy birthday. With me as your aunt, you don’t always have to work hard. You just have to play hard. Let the party begin. Happy birthday. I wished for a wonderful niece. Your Mom and Dad wished for an amazing daughter. When you were born, both our wishes came true. Happy birthday. I know your family, but you’re more a BFF to me. Happy birthday to my best friend (and my incredible niece). My wonderful, beautiful niece, you are more like a daughter and BFF to me. Just thought you should know. Happy birthday. Being my NIECE means you’re Nice, Incredible, Exciting, Courageous and Extraordinary. I love you. Have a wonderful birthday. When you started to call me Uncle, my whole life took a turn for the better. Much, much, much better. I love you. Happy birthday to my incredible niece. The moment you were born you stole my heart and soul...and everything in between. You’re my special gift. Happy birthday. To my sweet niece, I only have this advice for you: be yourself. You are perfection personified. Happy birthday. When I’m having a bad day, I just look at your beautiful face and everything’s better all of a sudden. Happy birthday. The official definition of niece – the daughter of your brother, sister, brother-in-law or sister-in-law — just doesn’t cut it. Mine is better: a wonderful, bright, beautiful young girl who is just like a daughter to me. Happy birthday. Chase your bliss and live well. Whenever you need a little extra support, know that I have your back. Happy birthday. You’re more than just my niece — you’re my best friend. Happy birthday. You may be my sister’s daughter but it’s obvious where you got your amazing looks — your amazing-looking aunt. Happy birthday. As you take this incredible journey called life, know that you are what. Happy birthday to my beautiful niece. Here's to all your dreams, fantasies and wishes come true today and forever. Happy birthday, our beautiful niece! With a wonderful niece like you, our family would not be wonderful. Happy birthday to my one-of-a-kind niece. You are the most precious jewel of all, my dear, dear niece. Happy birthday. If your parents don't throw you an amazing birthday party tonight, call me, your favorite auntie. I'll make sure you have one — because I could never say "no" to you. Happy birthday from your cool aunt. We're in your life for one reason — to spoil you rotten. Happy birthday from your favorite aunt and uncle. Just so you know: aunts and nieces are, by blood, automatically BFFs. Happy birthday, my sweet niece. My life suddenly became brighter the day my wonderful sister gave birth to you, my darling niece. Happy birthday. If we ever have a daughter, we want her to be exactly like you — happy, loving, wonderful and kind. Happy birthday from your beloved aunt and uncle. Time does indeed fly. It seems like only yesterday you entered this world — now you're a beautiful young woman ready to explore a whole new world. Happy birthday, darling niece. Your mom, my wonderful sister, gave me a wonderful niece to love. I can never repay her (not that I ever did in the past). Happy birthday. With your birthday money, get whatever you want for your birthday. We won't tell your mother. That’s what the best aunts and uncles do best. Happy birthday, our little angel. There's only one problem with a niece like you: you've made us become quite obnoxious, ready to brag about you to everyone we know — at the drop of a dime. Happy birthday. To us, nobody is as smart, beautiful and talented as you are. Happy birthday to our wonderful niece. Happy birthday. Whenever you need someone to trust — when everybody else has let you down – remember that you can always lean on me, your ever-hugging, ever-loving aunt. This may sound corny but a niece like you gives me hope, faith, trust and strength. You are my darling angel, my sweetheart, my daughter from another mother. Happy birthday. As my niece, you have a duty to ask me for anything you want — without hesitation. As your aunt, I have the right to spoil you rotten — without remorse. This is what I call family synergy. Happy birthday, sweetheart. Happy birthday to my wonderful niece. You are the lifeblood, pulse, heartbeat and breath of life of every family occasion. I'm so lucky to have a niece like you. You're my best friend, best daughter, best adviser and best critic whenever I need you to be. Happy birthday. Dearest niece, I hope your birthday celebration is so much fun that you can't help but have a truly happy birthday. Darling niece, I hope your birthday party goes down in the history books as the best one ever. Happy birthday! You are the most adorable niece in the universe. I love you so. so much. Happy birthday, sweetie pie. Dearest niece, just the thought of your beautiful, sweet face makes my day brighter. Happy birthday, sweetheart. A niece like you can make anybody's day, week, month, year, decade better. Happy birthday, darling. As your aunt, I have the right to look forward to lovingly hold you in my arms for hours and hours. Happy birthday, dear child. You may not yet know what I'm about to tell you: your birthday wish is my command. This goes for today and lots and lots of tomorrows. Happy birthday to my favorite (and only) niece. The greatest thing my sister ever did for me was to give birth to you, my precious niece. Happy birthday, honey bunch. What do Google and Craigslist have in common? Both cannot explain how much we love and adore you. Happy birthday to the world's cutest niece. You are now the only member of our family that makes me look forward to family occasions. Happy birthday to my beautiful niece. Happy birthday to my truly beautiful niece. May the candles on your birthday cake shine every brighter every year. How to be the cool aunt with the coolest words! As an aunt, you have a huge role to play in the life of your niece. Every year, your niece's birthday gives you the chance to show her how much you care. That's where the niece birthday wishes here play a role as well. Want to add more incredible sentiments to the niece birthday messages I have for you? Feel free to read the article, How to be a cool aunt, on sheknows.com for great ideas. This will definitely make you the coolest aunt in your niece's eyes. !